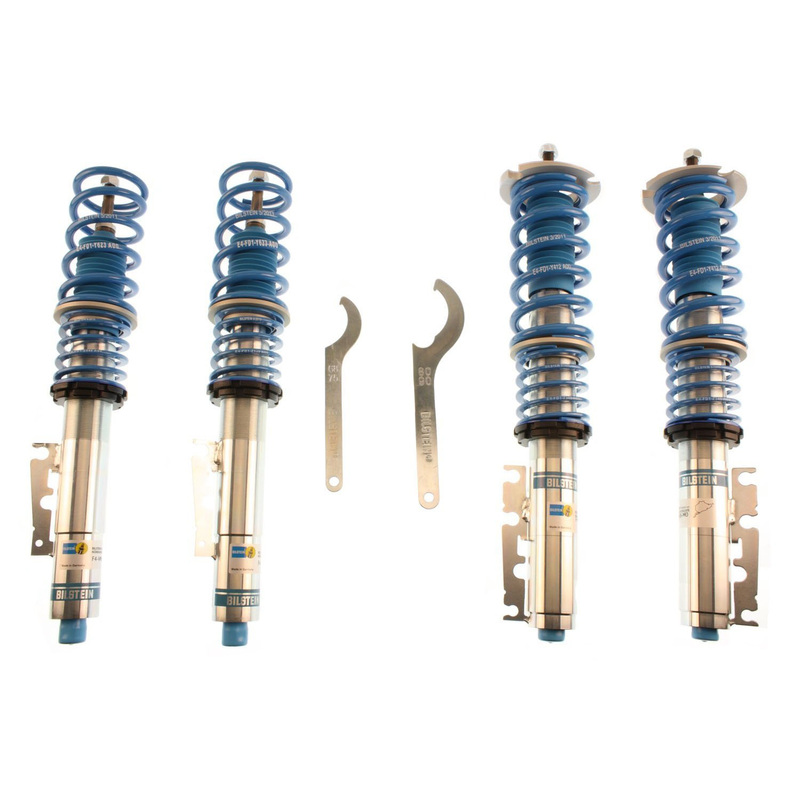 Utilizing Bilstein’s monotube shock absorber design for heat dissipation and ride control, the B16 (PSS9) Coil-Over System adds a matched performance spring and threaded ride height adjuster to provide a complete suspension system for a vehicle. The fully adjustable monotube gas shock absorbers offer nine precise compression and rebound settings, from comfort to competition. The front and rear progressive rate springs allow for the accurate adjustment of a vehicle’s ride height, stance, cornering balance and ride quality to maximize performance. Bilstein’s patented design allows the excessive heat from the oil to transfer to the outer surface of the shock body and dissipate more efficiently. The dividing piston also permits the oil to expand as heat builds, preventing aeration (foaming) and viscosity loss. This allows the shock to maintain full damping characteristics as temperatures rise. The tube of a Bilstein gas pressure shock or strut is fabricated using a special extrusion method. This process achieves an extremely tight peak-to-valley tolerance and maintains consistent wall thickness. Bilstein’s seamless monotube design provides superior tube strength while maximizing heat dissipation and shock life. The piston head design allows independent tuning of the compression and rebound damping forces to provide optimum ride comfort and performance without compromise. It features fewer parts than most conventional designs. The product’s simple, yet exceptionally functional digressive design contributes to the extreme durability and long life of Bilstein Shock Absorbers. Bilstein’s shock bodies are precision formed through a unique seamless extrusion process. This provides superior strength along with high finish tolerances. The shock body is then treated with a special paint finish durable enough to withstand grueling 240-hour salt spray tests. The finished body is mated with a solid, induction-hardened steel chrome plated and polished shaft, machined valving components and highest quality seals.